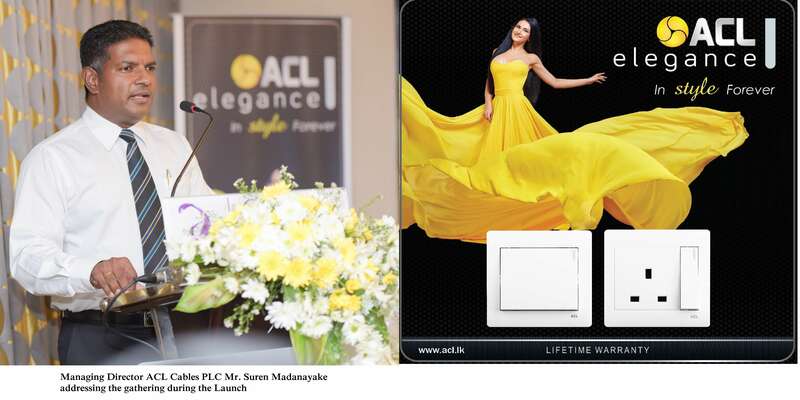 Sri Lanka’s premier cable manufacturer in Sri Lanka, ACL Cables PLC unveiled ‘ACL Elegance’, its innovative new switch and socket range for the market at a glittering event recently. The ACL Elegance range is manufactured at ACL Electric factory in Moragahahena, a fully owned subsidiary of ACL Cables PLC. Currently the initially produced range is fully available in Western Province, with ongoing plans to market the products in other areas with increased production capacity. “The newly launched range demonstrates the aforesaid four key features we wanted to improve and maintain in a switch and socket of this nature. As a result we are extremely excited to present ACL Elegance range to our consumers as we believe its unique attributes would overcome the barriers of other switches and sockets of the same range currently available in the market,” he added. ACL is renowned for continuously innovating its product range. In 2014, ACL launched its ‘VS Series’ range of switches and sockets, which is known today as the button type range. Perfectly combining legacy with innovation, ACL Elegance showcases unique features previously unseen in the sector. These include, a proportional/matching look on the dolly button and front plate, reflective lenses enhancing its elegant look, a firm but smooth switch action and a hairline gap between the dolly and plate. Additional features also include it being compatible to the standard mounting box signifying an easy replacement on an existing mounting box (where there is no requirement to replace a mounting box to a deep one when replacing with the Elegance series), bigger hole size terminals/oversize screws assure hazel free wiring and proper connectivity, front cover plate that can be easily be removed as and when required and high quality components and fire retardant material. While ACL Elegance’s basic range is white, consumers can also choose from a range of colour switches such as black matt, bronze and grey. ACL Cables holds a market share of 70% as a group, marketing a wide range of products including, electrical wiring (for households and construction projects), switches, sockets, trip switches, breakers, ceiling fans etc., with quality unmatched by any other manufacturer in the industry.